Act fast! 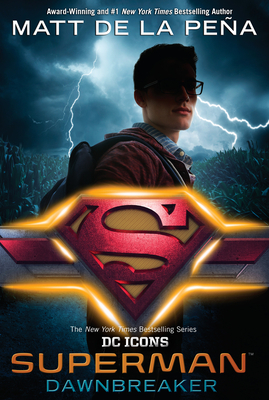 The first printing includes a poster of Clark Kent! Each first printing in the DC Icons series has a limited-edition poster--collect them all to create the full image! MATT DE LA PEÑA is a #1 New York Times bestselling and Newbery Medal-winning author. He has penned six critically acclaimed YA novels, including Mexican WhiteBoy and The Living, which was a Pura Belpré Author Honor Book. Matt's picture book Love was a #1 New York Times bestseller, and Last Stop on Market Street was awarded a Newbery Medal. Matt lives in Brooklyn, New York. Visit him online at mattdelapena.com and follow him on Twitter at @mattdelapena. He is a DC Icons author, a series in which the DC Comics super hero icons are written by megastar young adult authors. The series also includes Wonder Woman: Warbringer by Leigh Bardugo, Batman: Nightwalker by Marie Lu, and Catwoman: Soulstealer by Sarah J. Maas. "The trickiest aspect of any Batman narrative is getting into Bruce Wayne's head, and [Lu] doesn't miss a beat."